AUSTIN, Texas (Reuters) - A trio of inmates are scheduled to be executed on Thursday, one each in Alabama, Florida and Texas, raising the possibility that U.S. prison authorities will carry out three death sentences on the same day for the first time since 2010. The circumstances behind each case could halt any of the executions, including the one in Texas, where the convict received an unprecedented clemency recommendation. The state has conducted all three of this year's U.S. executions. In Florida, questions were raised about holding an execution based on a majority, not unanimous, jury decision. In Alabama, lawyers have said the death row inmate is too ill to be executed. 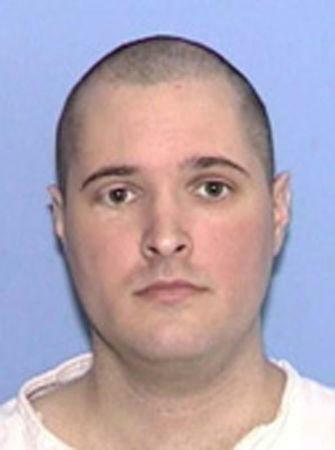 On Tuesday, the Texas parole board in a unanimous decision recommended clemency for Thomas Whitaker, 38, based on his father's request. The younger Whitaker was convicted of masterminding a 2003 plot against his family in which his mother Tricia, 51, and brother Kevin, 19, were killed. His father, Kent, was shot in the chest and survived. A devout Christian and retired executive, Kent Whitaker said he had forgiven his son and that his family did not want him to be executed. In a clemency petition, the father said if the death penalty were implemented, it would make his pain worse. Republican Governor Greg Abbott has the final say. A few hours ahead of the execution, scheduled for 6 p.m. (0000 GMT), he had not yet announced if he planned to commute the sentence to life in prison. Thomas Whitaker has been moved to a holding cell near the state's death chamber in Huntsville and his father plans to witness the execution if it goes forward, family lawyer Keith Hampton said. Alabama plans to execute Doyle Hamm, 61, at 6 p.m. (0000 GMT) for the 1987 murder of motel clerk Patrick Cunningham. Hamm's lawyers have said he has terminal cancer, adding that years of intravenous drug use and untreated lymphoma had made his veins unstable for a lethal injection. A court-appointed doctor examined Hamm on Feb. 15 and found he had usable veins, according to court filings. Florida plans to execute Eric Branch, 47, for the 1993 murder of University of West Florida student Susan Morris. Lawyers for Branch appealed to the U.S. Supreme Court, citing arguments including that the court previously blocked a Florida provision that allows executions for a non-unanimous jury decision and should do so again in this case. The last time three executions were held on the same day was in January 2010 in Louisiana, Ohio and Texas, according to the non-profit Death Penalty Information Center.